NYC may have run out of brownstone but that doesn't mean we can't substitute it with something more abundant and certainly more delicious - gingerbread! Meticulously crafted to have all the charm of the real thing, "Gingerbread Brooklyn" is an entire block of edible brownstone and other kinds of homes baked up by chef Renee Baumann and friends to be auctioned off to benefit City Harvest. We recently had the pleasure of visiting this miniature architectural wonder at 61 Local and were enchanted by its details - from sugar-glass windows that really light up to tiny fire escapes made of spicy cookie. Click through our gallery to see them all for yourself. Gingerbread Brooklyn was dreamed up by Ms. Baumann as a way to raise money for City Harvest while doing what she loves best – baking. Renee is no stranger to cookie architecture. Last year, she created a single gingerbread brownstone which was so well-received that she decided to attempt an entire block of edible homes this year. Don’t forget to click through our gallery to see all of the miniature wonders Gingerbread Brooklyn holds, or go see it for yourself at 61 Local in, of course, Brooklyn. If you’re interested in making your own version (perhaps a Gingerbread Queens? ), check out Renee’s DIY tutorial here. I meandered into a used book store lnoikog for turn of the century romance novels which happen to be one of my favorite genres and the clerk at the store pointed me in the direction of this book. It took me awhile to pick it up once I brought it home, I must admit, but by the time I started I knew I was in for a treat. I think I howled with laughter through much of it but it also has the added bonus of making you think! I particularly loved the hedge maze part and the musings on whether or not things they held current would become antiques (and the answer to JKJ is yes!). PS: I've never thought about making chocolate covered gingerbread! Brilliant idea! Gingerbread Brooklyn was dreamed up by Ms. Baumann as a way to raise money for City Harvest while doing what she loves best - baking. The edible display features wonderful details like fanlight windows made of sugar that can be seen over doorways in real Brooklyn homes. The windows even light up! You might also recognize these iconic stoops that are the envy of all New Yorkers. This door even has some festive holiday decor that seems to be made out of rosemary. Renee is no stranger to cookie architecture. Last year, she created a single gingerbread brownstone which was so well-received that she decided to attempt an entire block of edible homes this year. Some of the homes in the display look more like regular apartment buildings and even have tiny fire escapes. Despite the size of the buildings and the medium used, the architectural details have been preserved. A little corner window like the kind you might see on a real Brooklyn block. A mini red door glows deliciously. Little logs line the front of the iced "sidewalk" in front of this apartment. Gingerbread Brooklyn was dreamed up by Ms. Baumann as a way to raise money for City Harvest while doing what she loves best - baking. Renee is no stranger to cookie architecture. 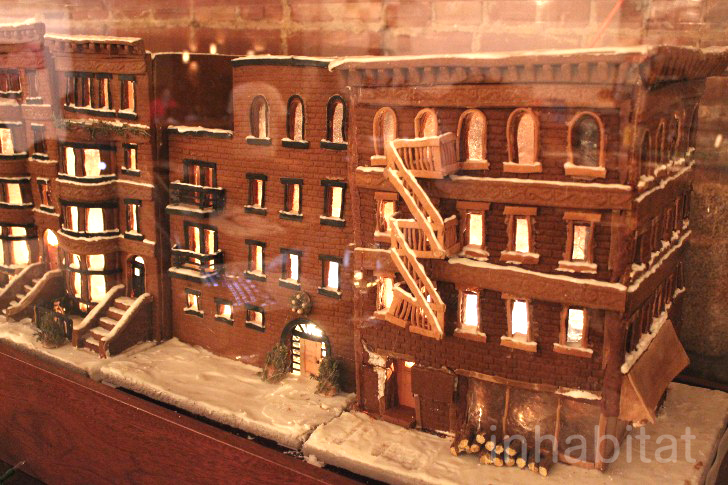 Last year, she created a single gingerbread brownstone which was so well-received that she decided to attempt an entire block of edible homes this year. Don't forget to click through our gallery to see all of the miniature wonders Gingerbread Brooklyn holds, or go see it for yourself at 61 Local in, of course, Brooklyn. If you're interested in making your own version (perhaps a Gingerbread Queens? ), check out Renee's DIY tutorial here.